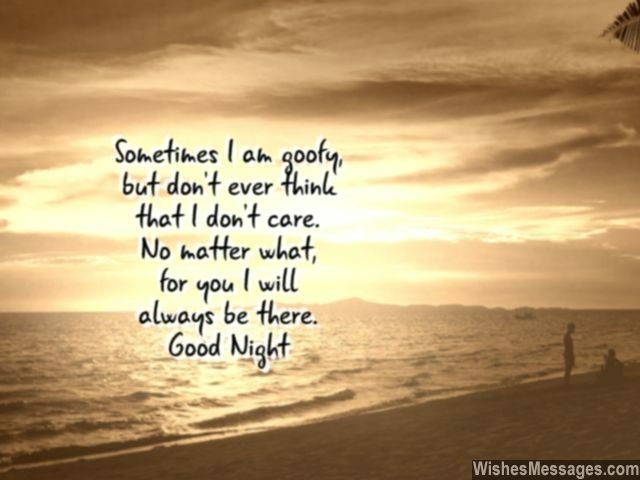 Good Night Messages for Friends: Think you’re way too cool or a tad too mature for a cute banter with your bestie? Think again. Friendship’s memories revolve around spontaneity and all the crazy things you do. Poke your friends with a sweet message or an inspirational quote while you are rolling around in bed. Texts, Facebook posts, tags on Twitter or shares on Pinterest – do whatever it takes to share smiles, hugs and kisses with the very people who make your life awesome. If you still think that this sounds like a lame thing to do, just stop thinking and do it. The awwws and the funny reactions will go down as sparkles of awesome memories that you’ll later miss from the bottom of your heart. 2) The brightest stars in my life are not planetary objects, they are friends like you who shine through night and day. Good night. 3) Boyfriends and girlfriends will come and go, but our friendship will forever radiantly glow. Good night. 4) The memories of our friendship are like the radiance of the moon and the fun times we’ve had together are like the twinkle of the stars that light up my life’s skies. Good night. 5) Real friendship is when misfits come together and find that they’re the perfect fits for each other. 6) Sometimes I am goofy, but don’t ever think that I don’t care. No matter what, for you I will always be there. Good night. 7) Whenever I feel bogged down by life’s worries, I simply dive into the beautifully endless abyss of our friendship’s memories. Good night. 8) In life, success is not always measured by how big you can dream. Real success, is often measured by the number of friends you can share your dreams with. Good night my friend. 10) Even the melancholy of a dark and lonely night transforms into a sweet harmony when I think about the memories of our friendship. Good night. 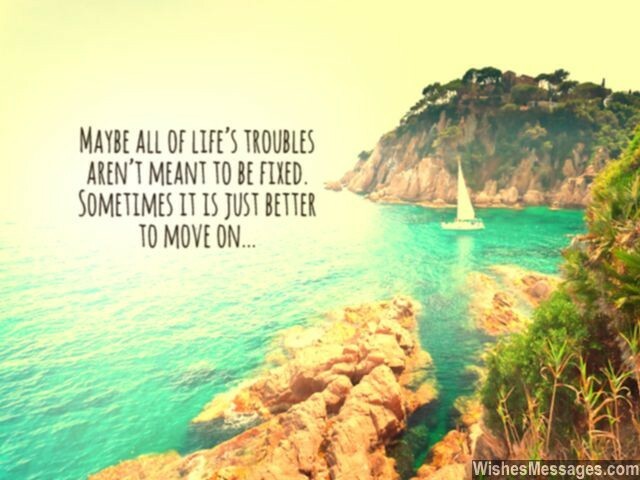 11) Maybe all of life’s troubles aren’t meant to be fixed. Sometimes it is just better to move on. 12) I won’t take any selfies for the next 12 hours… not because it’ll be dark but because they’ll be without friends like you. Good night. 13) The calm silence of the night is a reminder of how blissful and serene my life has become after we became friends. Good night. 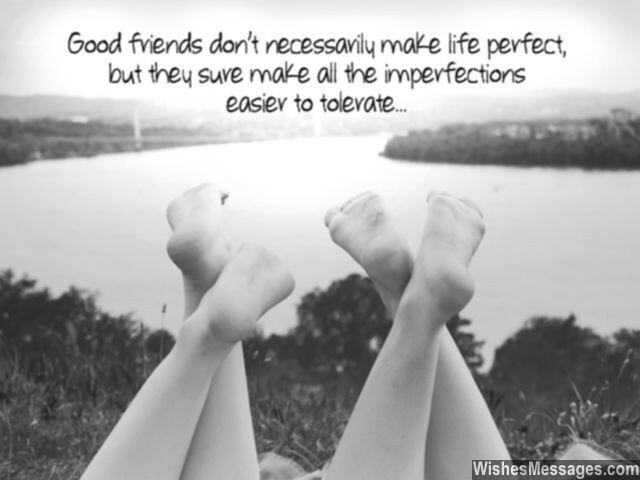 14) Real friendship is where quirks are celebrated, eccentricities are applauded and idiosyncrasies are flaunted. Ours, is exactly like that. Good night. 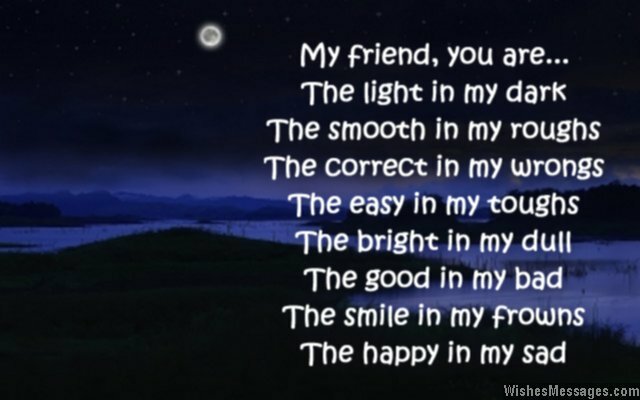 15) Just like how the bright stars light up a dark night sky, the memories of our friendship are the twinkles in my life. Good night. 17) Hold your phone tightly because this text message is a hug in disguise. Good night. 18) A real friend is someone who’ll call you their own, when everyone else calls you an outcast. 20) Regardless of the size of your bed, don’t stop yourself from dreaming king size. Good night. 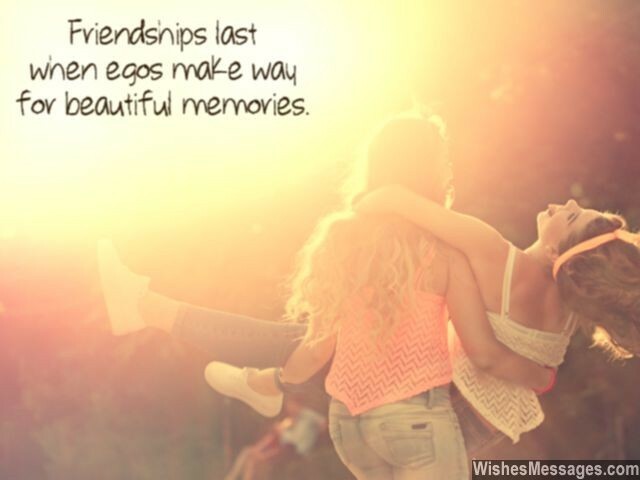 21) Friendships last when egos make way for beautiful memories. Good night, my friend. 23) I could have sent you a funny joke, inspirational quote or a sweet message. But I have chosen to simply remind you that we are best friends… because our friendship itself makes our lives FUNNY, INSPIRATIONAL and SWEET. Good night. 24) Friends are the sunshine that light up your life’s dark skies. Good night. 26) My friend, you are… the light in my dark, the smooth in my roughs. The correct in my wrong, the easy in my toughs. The bright in my dull, the good in my bad. The smile in my frowns, the happy in my sad. Good night. 27) When I say good night to special friends like you, it is an all-in-one wish which means Good Night, Sweet Dreams, I Miss You and See You Soon. 28) The only reason I have the sweetest of dreams is because I look forward to spend the next day with awesome friends like you. Good night. 29) I hope that your dreams take you to a land where you can drive the fastest cars, date the prettiest girls and play the best video games all night long. Enjoy it, because I don’t see you getting any of that in real life. Good night buddy. 30) Send me a text if you can’t sleep and call me if you get nightmares. I will kick the living daylight of all your bad dreams. Good night. 31) Stop thinking about all the things people said to hurt your feelings. 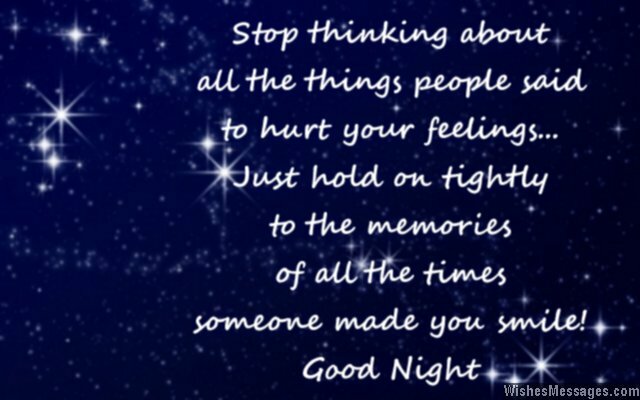 Just hold on tightly to the memories of all the times someone made you smile. Good night. 32) May the dark clouds of the night shadow all your worries. May the shining stars illuminate your dreams, and may the soft moon be a soothing balm to all the troubles in your life. Good night. 34) Stuff your worries in your pillow, wrap your troubles in your blanket and spread your anxieties on your sheets. When you wake up tomorrow you may have dirty linen, but more importantly you’ll have a fresh mind and a happy heart. Good night. 35) Stop mulling over yesterday and stop worrying about tomorrow. Live life NOW. Good night. 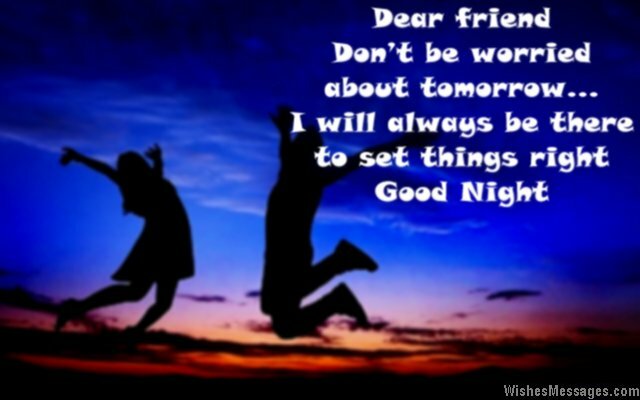 36) Dear friend, don’t be worried about tomorrow, I will always be there to set things right. Good night. 37) Welcome aboard Sweet Dreams Airlines. You are the pilot of your flight to any destination in the world… in the company of sweet friends like me. Enjoy, good night. 38) Use every passing moment of the night to dream about all that you want to achieve in life… and use every second of the following day to achieve every dream you saw the previous night. Good night. 39) Laughs, smiles, cries, frowns, fights and pranks – I’d have missed all of life’s bestest emotions if it weren’t for a bestie like you. Good night. 40) Just like how the skyline looks at night, our friendship adds a sense of character and glamor to my everyday life.